A lot of bands put out special one-off collaborations. Not many actually perform those one-off songs in a live setting. Officially, surprisingly MORE jealous of those who went – as this seems legendary. 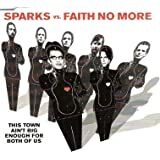 FYI, the recorded version was released as a UK single and on Sparks’ Plagiarism album.